How one perceives the universe is not the same thing as what the universe is made up of. Right and that's exactly where the idea lies. As I am writing this, the HAF website looks like a grayish-blue to me. But how do I know that my grayish-blue is the same as your grayish-blue? It is not, but that does not matter. What I codified to the area of the light spectrum that we identify as blue, doesn't actually matter if you codify is as something different. It's like having to different database systems talking to each other. What specific id you place on the "blue" record, let's say it's 12, doesn't have to match the same id I place on my "blue" record, let's say it's 7. We have a translation to make the color less subjective by using common language. When you say "blue" I identify it as 7, and when I say "blue", you identify it as 12. They don't have to have the same exact id in both systems. 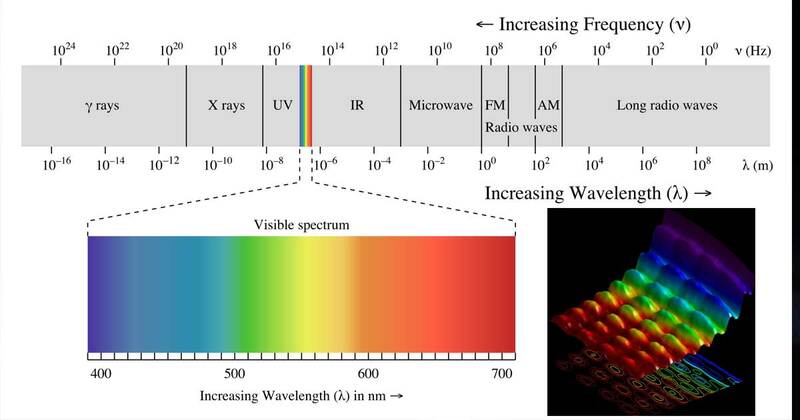 We can objectively test where the color falls on the light spectrum because the color itself is not subjective, what is subjective is how our individual brains codify it. Blue is that there on the left. It will be there for everyone with the ability to perceive blue. Boltzmann Brains (the concept presented that I could just be a brain floating in space pretending to be experiencing a universe), are not something new, but it's easy to disprove. The universe as it began, is far less complicated than a brain popping into existence out of the chaos. Therefore, on an infinite time scale, our universe would happen far more often than brains with the ability to hallucinate a simulation like we are experiencing. And we all agree that there is often something wrong with our perceptions, that's why we follow the scientific method, which over time corrects for that problem. ^^Right. What you are talking about is a shared reality. A reality that everyone agrees is there. But sometimes there are differences in what one perceives and another does and that gets communicated, and then arguments and misunderstandings happen. But it all stems from how the individual has been interpreting the world. Now don't get hunky funky on me because I'm about to explain something someone might call psychedelic. There are ways to "hack", for lack of a better term, your brain. Maybe not all. But certainly some parts that we know about for sure. The way the short term memory works is by narrative, for example, before it's sent to the long term-memory. It's actually used a lot in therapy when dealing with depression or other psychological issues. But what I have noticed is that you don't need a therapist if you can do it yourself. You slowly over time rewrite your life story and suddenly a lot of things don't seem so bad. I think I actually got that bit from xsilverphinx on here about the short term memory. I may be wrong. But that has a lot to do with the functioning of schizophrenics. The short term memory is experiencing some issue in the brain that causes weird ideas. And that makes them paranoid or delusional or bizarre ideas that are not anything that they have grown up with or apart of their culture. So yeah, Dave was correct in saying that is how indoctrination works. Especially why people like to use the bible apparently as a tool for brain washing because you can get a feed back loop that is already built into the brain that you can just enter an input and then get what you want out. Much like a computer actually. Enter input, get output. I think that shared reality as I know it, is not what I'm talking about. I'm saying that there is a reality that we are all perceiving, even if we do not perceive it accurately, we are still perceiving it. Reality is what it is with or without us. Shared reality as I know it, is the idea that all conscious entities are experiencing a reality based on all their consciousnesses working together. I don't think that this is the way reality is. If I ask someone what their house number is and they say 12863 but I remember it as 12683, there are not two realities where the person's house number is both, I was simply wrong. That is not two separate realities, that is me remembering something wrong. Memories are changed all the time, that doesn't change reality, that only changes what one remembers of reality. I'm not really down with the idea that we each have our own realities (though I can understand it), because I think that it over complicates things for no good reason. Sometimes we are simply wrong, no need to try to justify our errors by inserting a reality into our heads, just correct it and move on. One reality is enough to worry about. But sure, if you want to think about your mind as your own personal reality, and everyone else has their own personal realities, that's fine with me. I have thought a lot about thinking about it that way, and I find it too cumbersome when dealing with fixing things in the real world. I remember one of the crew of the first shuttle saying that the memory was so small they had to carry a set of programs on media. As each task of the mission was completed they would reboot and load in the cassette for the next task. I read of Turing looking at options for memory. Cathode ray tube, the old type TV, I don't know how he was going to work it. The government in its beneficence has decided to let slide your perverted behavior. Not terribly good in terms of bytes/m^3! I think thermionic vales were also used as memory units in my lifetime, vaguely remember a "turtle" that had a bunch of valves, some as switches, some as memory. Vague memories of it being demonstrated on "Tomorrow's World". Skywatchers are happy because Mars is at its' perigee along about now. The planet will appear much larger than it does at other times when it is getting farther away from earth. Mars will be visible to the naked eye and even a small telescope can reveal some details of the planet. Unfortunately there are great surface storms going on right now and the surface of Mars may not be as clear as observers would like. A magic number? This is not abut winning the lottery but it may be worth some attention. When I’m reincarnated I’m going to be able to do maths like Laurence Eaves (or be an opera diva) V jealous. This thread has been quiet for some time now. There is so much to learn and much to ponder. Here is a subject that might get us all atwitter. For sure it will get the religious ones attention. CRISPR explained in some depth in this video. It is an hour long but worthy of the attention of we philosophic types. Thank you for that, Icarus. I watched the first 6 minutes; I can't wait to watch the rest when I have more time. She is an impressive speaker. These Fast Radio Bursts (FRBs) have been known for a while. The oddity here is the apparent 'repeaters' and I suspect that in due course these will be identified as a rotational or oscillating natural source just as pulsars turned out to be rotating neutron stars.